Cover Title: "Deathstorm: Ground Zero!" Nova and Grot are in pursuit of the Luphomoid villain, Kraa! As the two warriors search the planet, the object of their search is waiting. Suddenly, Kraa reveals himself and ambushes the two heroes! Grot takes a direct hit and lands motionless. Nova avoids the initial attack and turns to face Kraa! But Nova has changed his uniform to resemble the one given to him by Rhomann Dey! Hearing Rhomann Dey's name, Kraa realizes that the Nova he faces is the one who helped stop his brother, Zorr years ago. Swearing vengeance, Kraa begins blasting his weapons at the young Earthman. Nova easily avoids the blasts and unleashes a full gravimetric pulse at his foe! As the two continue their fierce battle, a figure steps from the shadows. It's Kraa's brother, Zorr! Zorr tells his sibling to stop fighting and learn the ways of the blue-skinned Kymaera, as he has. Nova realizes that it is not Zorr who has bought him time to recover but Grot. Grot has used his Skrull shape-shifting abilities to deceive Kraa! The Skrull warrior had used the name of Nova's friend, Kymaera, to inform Nova of the deception. However, the effort of assuming Zorr's form has proven too much for Grot's injury-ridden body and he falls. Swearing his own vengeance to Kraa, Nova unleashes his full fury at the Luphomoid! Kraa tries to stop Nova but finds his fist stopped in mid-air by Nova's hand! The murderous alien is then knocked completely unconscious by one fury-filled punch from the Human Rocket! After watching his foe fall, Nova turns to find a revived Grot coming towards him. Grot admires Nova's courage and tells him that the Xandarians have sent a group of Centurions to take Kraa back to Xandar. He also tells his friend to leave before they arrive because Nova will be taken along with Kraa due to his refusal to leave Earth when Queen Adora originally ordered him to Xandar. Nova thanks his fellow warrior and leaves for Earth. Elsewhere aboard the Aakon's space station, Ram's Head, Daakor has installed the final component needed to generate Deathstorm. At the edge of the solar system, Nova bursts through the Stargate and heads towards Earth. Back at his parent's house, the young hero talks to his younger brother, Robert about Deathstorm. Robbie has been working on a solution to stop the cosmic threat but can't reveal his theory. Nova 0:0 told Robbie that any information he gives to Nova may influence a wrong decision at a crucial time. Nova's brother does provide him with a clue. He tells Rich to "become as an empty vessel". Before Nova can find out the meaning of the phrase, he receives a signal from Nova 0:0 who is in deep space. Nova rushes to the planet Mars to find Nova 0:0 in combat with Aakon soldiers! As the Human Rocket rushes to fight by his side, Nova 0:0 tells him to go aboard Ram's Head and stop the Deathstorm device. As Rich heads towards the space station, Nova 0:0 takes a fatal blast from an Aakon Molecular Disruptor Gun. Meanwhile on Ram's Head, Nova has burst through the station's hull and furiously battles his way through the Aakon soldiers. However, Nova is too late to prevent the beginning of Deathstorm! He tries to use a gravimetric pulse on the weapon but finds his energy absorbed by it. Suddenly, the young hero realizes he isn't looking at the weapon itself but a simulacrum (a holographic image) of the sun. Nova turns to a monitor to see the real sun's surface begin to change! Realizing the Deathstorm bomb isn't on Ram's Head but in the sun itself, Nova flies to the center of the solar system! At the sun, Nova figures out how Deathstorm works. The simulacrum actually absorbs the sun's energy and uses it to alter sunspots into a large black mass. The black mass is then sent towards its target. Suddenly, Nova sees the black mass erupt and begin its destructive path towards Earth! Using the advice given to him by his brother, Nova empties the Nova Force from his body thus creating a net of expanding energy. The energy field captures the Deathstorm force and draws it into Nova's body which is now an "empty vessel"! Having absorbed the entire black mass of Deathstorm, Nova streaks to the edge of the solar system! 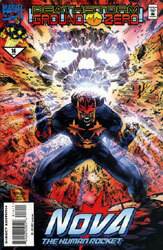 No longer able to contain the fierce forces in his body, Nova harmlessly releases the black energy. The energy is so powerful that the solar system appears to have gained a temporary new star! The shockwave of the force reaches Mars' orbit and destroys Ram's Head. On the Martian surface, Nova finds Nova 0:0 fallen body. Nova 0:0's helmet has fallen off and Nova is stunned to see who his ally really is. Nova 0:0 is really Robert Rider of an alternate universe. Nova 0:0 reveals that, in his universe, it was him, not Rich, who received the Nova force. With his last breath, the alternate Robbie tells Rich he is proud of him.